Why were timpani tuned most often in tonic-dominant? Beethoven sometimes broke the rule that is listed above. For example, in the scherzo of his ninth, the timpani tuning appears as F3-F2. Some other composers broke the rule, too. Still, the timpani were most often tuned in tonic-dominant, as listed above. What's the reason? Timpani were traditionally tuned as they most often were because there wasn't much other choice in their limited range, because of tradition, or because people couldn't think of anything better to do with them. Beethoven lived in a time where the art of instrument-making advanced dramatically (in fact, he drove some of those advances himself), he was a revolutionary by nature and he had more imagination in his little finger than most of his predecessors combined. So it's no wonder that he should have been the first to use e.g. the tritone or the octave in place of the traditional tonic/dominant tuning. Beyond the fact that the use of timpani in classical music was relatively new during the classical period, the tonic-dominant practice was the practical result of drums that were "fixed" in pitch. That is, the pitches could not be altered during a performance. This was because early timpani had no tuning pedals like their modern counterparts. They were simply a copper bowl with a calfskin head, held in place over the bowl with a steel "counterhoop" (that pressed down around the edges of the skin head) and several large bolts. The drums could be retuned by turning all the bolts, but this was time-consuming and impossible during a performance. The first pedal-tuning mechanism for timpani, if I remember correctly, was developed in Dresden, Germany sometime in the early 19th century. This of course inspired a revolution in writing for timpani. As was mentioned above, Beethoven was the first to push the boundaries of what could be done with timpani in orchestral music. But his innovation was in the rhythms he wrote, as well as actually using them in soloistic ways (the greatest example being in the scherzo of his 9th Symphony). 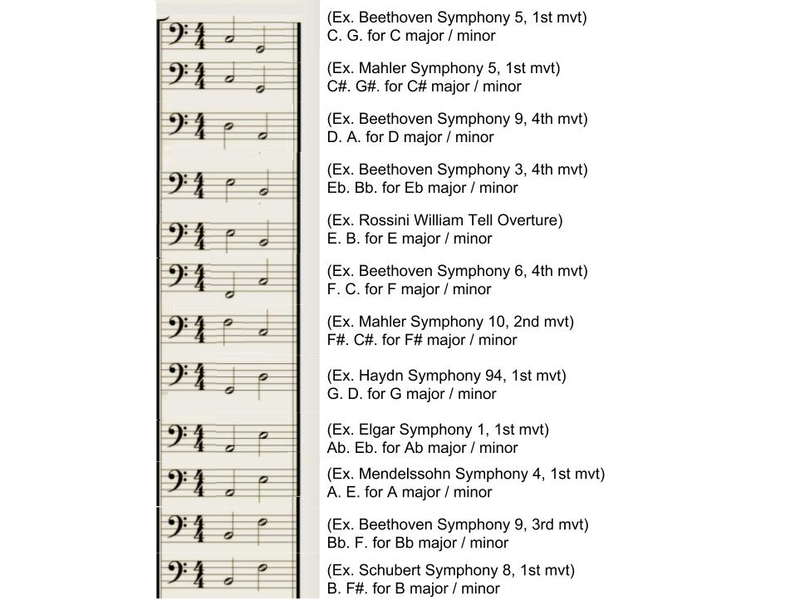 But even Beethoven symphonies still generally adhere to the tonic-dominant scheme. An interesting side note: there are actually a few moments in Beethoven symphonies (I can't think of where off the top of my head but they are definitely there) where the entire orchestra (particularly the brass, which the timpani part often mirrors) plays V-I, and Beethoven actually had the timpani playing IV-I, resulting in a major 2nd clashing between the dominant and subdominant. This was obviously because Beethoven had a choice between leaving the timpani out at a climactic moment (knowing the timpanist couldn't retune his drum), or just saying "What the hell?" and having the timpanist play the wrong note. It's wonderful that--in true Beethoven style--he opted for the "What the hell?" approach. Modern timpanists, with the aid of pedal-tuned drums, often "correct" these instances by retuning the drum. This often results in heated debates over authenticity--and whether or not it's ethically correct to "fix" Beethoven's score? After the invention of pedal-tuned timpani, composers such as Wagner and Bruckner began to expand the number of pitches played within a single work. It really wasn't until Mahler came along that the use of timpani "exploded." Mahler remains to this day the greatest music in the entire classical repertoire to perform as a timpanist--both for his melodic use of the instrument, as well as the prominent role he gave the instrument in all of his symphonies. A pair of two timpani is very common. As been said there are no rules, but if there are only two timpani instruments available then you need to use the range that is possible on those two drums. That means you would sometimes need to make the tonic-dominant downwards and other times upwards. If you have more instruments, like 4 or even more, which have different ranges you have more possibilities. One timpani drum has a range of a fifth by the way. Not the answer you're looking for? Browse other questions tagged tuning timpani or ask your own question. Why are orchestras tuned differently? Why is dropped D tuning used so often? Why are double strokes (with the same hand) taboo on timpani but recommened on snare? Why are some/most B♭-clarinets tuned to A=442 Hz? Violin Tuning- shouldn't the the A-string be tuned to A5? Why A4? Why is a tenor banjo typically tuned in fifths? Why are ukuleles tuned like they are?